Here is a recap of Championship Sunday of the 2015 NFL Playoffs with Monday Afternoon QB. Thanks again to the AP Sports/Pro 32 for photos & articles. SEATTLE (AP) — The loudest stadium in America was silent. A return trip to the Super Bowl was slipping away. Time for the Seattle Seahawks to show why they are champions. “You have the belief these guys have in one another, there is nothing you can’t do,” coach Pete Carroll said after an implausible comeback for a 28-22 victory over Green Bay in the NFC championship game Sunday. Plagued by turnovers and outplayed much of the day, the Seahawks staged a stunning rally built on resilience. Russell Wilson, who struggled until the final minutes, hit Jermaine Kearse for a 35-yard touchdown 3:19 into the extra period to win it. The Seahawks became the first defending champion to make the Super Bowl in 10 years, and will play the AFC champion New England Patriots, who routed Indianapolis 45-7. How Seattle got there was stunning. Seattle (14-4) trailed 19-7 with about four minutes remaining and had been ineffective on offense all game. Wilson finally put a drive together with passes to Doug Baldwin and Marshawn Lynch — initially ruled a touchdown but called back because he stepped out of bounds. Wilson finished with a 1-yard scoring run to cut the lead to 19-14 with 2:09 left. The onside kick went high to Packers tight end Brandon Bostick, but he couldn’t gather it, and Seattle’s Chris Matthews recovered at the 50. The crowd, quiet since Seattle fell behind 16-0, came alive, and Lynch sped and powered his way to a 24-yard TD run. On the 2-point conversion, Wilson — about to be sacked — threw a desperate pass hauled in by Luke Willson to make it 22-19 with 1:25 remaining. Aaron Rodgers, limping on an injured calf, calmly led the Packers (13-5) downfield to set up Mason Crosby’s fifth field goal, a 48-yarder with 14 seconds to go to force overtime. Then Wilson and Kearse struck, with Kearse — the target on all four of Wilson’s interceptions — beating Tramon Williams on the winning pass. Kearse has also caught the winning score in last year’s conference title win over San Francisco. Until the final minutes, there seemed to be no doubt the Packers were headed to the big game Feb. 1 in Glendale, Arizona. Despite All-Pro Rodgers’ injury, Green Bay and its overlooked defense was carrying the day. Special teams trickery lifted the Seahawks back into the game after falling behind 16-0. Their first touchdown came on a fake field goal when holder Jon Ryan threw 19 yards to tackle eligible Garry Gilliam in the third quarter. 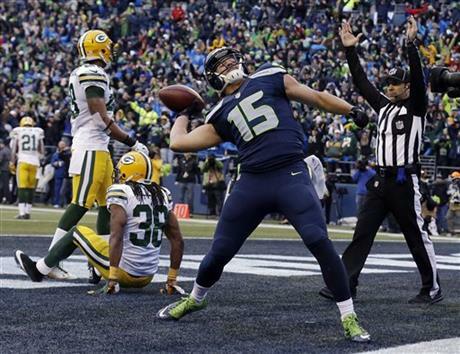 And Matthews’ onside kick recovery kept the Seahawks alive. Lynch rushed for 157 yards on 25 carries and was the one consistent offensive force Seattle had. He was crucial to both late scoring drives in regulation. The 16-point comeback was the largest ever in a conference title game. The Colts defeated the Patriots after trailing 21-6 in 2006. The matchup of Green Bay’s top-ranked scoring offense against the league’s stingiest defense instead was being controlled by the Packers’ ability to stop — and turn over — the Seahawks. The five giveaways were the most in the Carroll era that began in 2010. The silence of the fans was remarkable for much of the windy, intermittently rain day. Rookie safety Ha Ha Clinton-Dix had two interceptions and Green Bay sacked Wilson five times. Seahawks All-Pro cornerback Richard Sherman played much of the final quarter holding his left arm at his chest. The center of conversation after last January’s NFC championship win against the 49ers, he quietly left the field with his arm still pinned to his body, an NFC championship towel hanging off his right arm. Rodgers didn’t shy away from throwing at Sherman, and in an early matchup of All-Pros, Rodgers’ pass to rookie Davante Adams in the end zone was snagged by Sherman. But the Pack was right back in scoring position moments later when Clinton-Dix grabbed a tipped pass and returned it 26 yards to the Seattle 4. Fullback John Kuhn, another All-Pro, had his TD dive reversed by a replay review and Seattle held. Crosby made it 3-0. Doug Baldwin fumbled the ensuing kickoff at his 23, and Crosby made a 19-yarder. It didn’t get better in the first half for the hosts. Randall Cobb caught an 18-yard TD pass on the final play of the opening quarter to make it 13-0; Green Bay outgained Seattle 137-3 in the period. 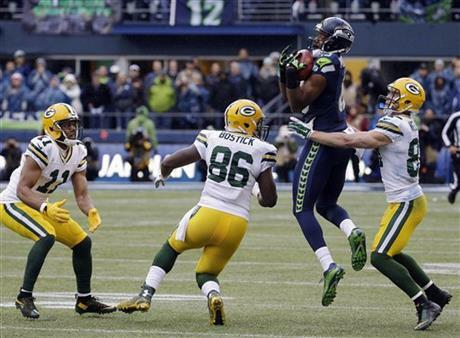 The Seahawks’ initial first down came nearly eight minutes into the second quarter. Crosby nailed a 40-yarder to conclude Green Bay’s dominant first half. Wilson was picked off three times, had a QB rating of 0.00, and Seattle was fortunate it didn’t trail by more. Even after the fake field goal TD made it 16-7, the Seahawks didn’t seem likely to pull off the comeback. 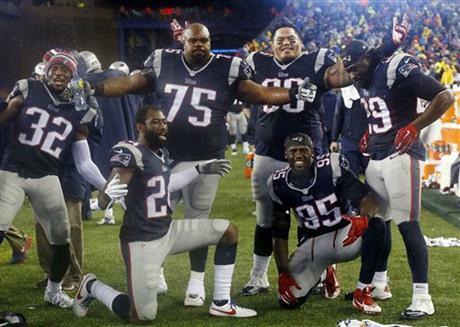 Yet they did, becoming the first team since New England a decade ago to return to the Super Bowl. FOXBOROUGH, Mass. (AP) — Bill Belichick and Tom Brady are headed to a special place where no coach or player has gone more — the Super Bowl.